The 380 ACP was developed in 1908 and has been a very influential round throughout history. This caliber was commonly issued to aircrews during the Second World War and was used in Europe for decades as a law enforcement round. All this history just goes to show how effective this round can be and due to the availability of pocket sized pistols, the 380 ACP has had a surge in popularity in recent years. 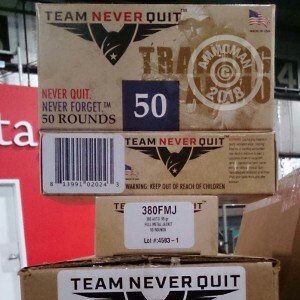 When you get Team Never Quit ammo, you are getting ammo designed by Veterans to honor the men and women who protect out freedoms and never quit. TNQ was launched by former Navy SEAL Marcus Luttrell. With this excellent 95 grain, full metal jacket, re-loadable ammo, never quit practicing and preparing. This ammo is proudly loaded in the USA.